Packs of men, women, and children are rounding the corner of Albion Street with their hands full of fire. The blazing torches they clutch look like matchsticks made for a giant and their flames burn in unruly shapes. Every so often, when the head of one of these torches detaches and tumbles, someone hoofs a ball of fire along the street for ten metres before it expires. It rolls in slow motion: arsonist’s tumbleweed. Metal troughs rattle past, brimming and spitting with a fire fed by whatever’s been left to smoulder at the side of the road. Their heat is so intense I have to turn away. 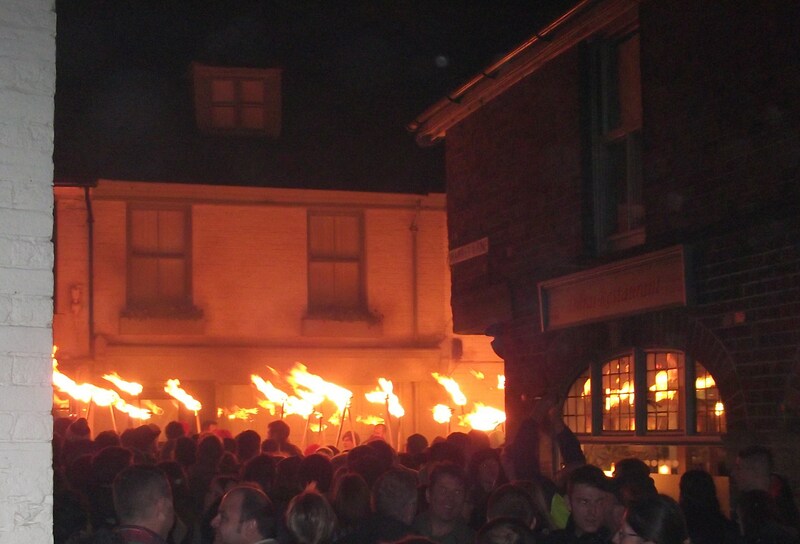 This is Lewes on Bonfire Night, when a drowsy East Sussex market town wakes up with its eyes ablaze. Each year, its picturesque streets stage an edgy pantomime which fuses together local celebration and commemoration (of the town’s 16c. Protestant martyrs, primarily, but also of the men it lost in the two wars), anti-popery, and topsy-turvydom left over from Halloween. Above all, it’s a warrant for fervent, gleeful pyromania. We’ve come by coach from London to join the fray. The town’s population is barely 15000 and tonight they’re hosting around 80000 visitors, so the event is bound to generate the kind of confusion that easily ferments when large crowds assemble in spaces which weren’t designed for them. But the disorientation I feel here is something more: the town finds ways to toy with me all evening and, as when I draw back from the fire-trough’s heat, never lets me enjoy the spectacle without also deliberately provoking some kind of discomfort. Processions and parades are there to be looked at. But, from cortège to carnival, they also exist in being looked at, in the give-and-take between who’s walking and who’s watching (there’s an unnerving, dispiriting scene in Vittorio De Sica’s Miracle in Milan, when the hero traipses through the city behind his foster-mother’s hearse in a one-man retinue that the traffic doesn’t even stop for). 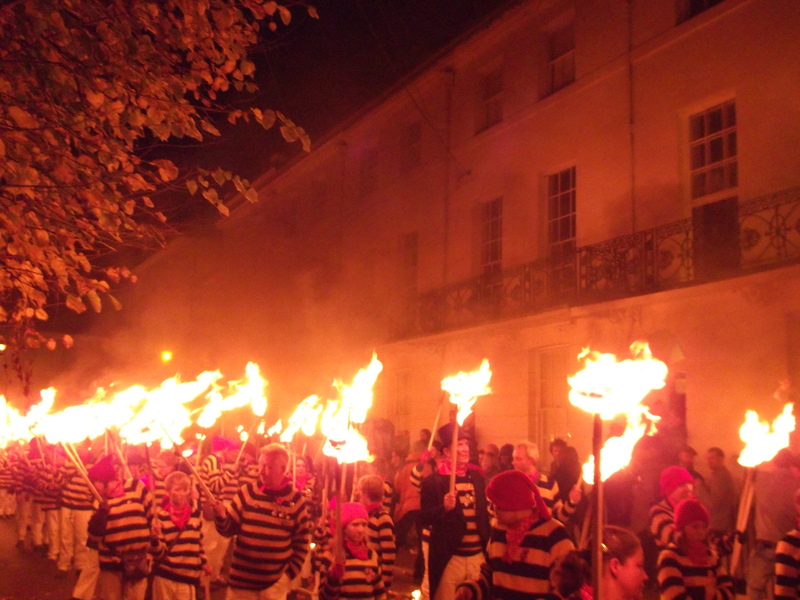 In Lewes, the costumes are theatrical and the torches cast a lambent orange glow across the marchers. It’s as if they were carrying their own stage-lighting. There are weald-men blacked up as Zulu warriors. There are Red Indians with huge bursts of plumage, French revolutionaries, and soldiers from this or that civil war. A boy emperor commands a triumphal chariot made of papier-mâché. There are Tudor dames, Dickensian urchins, Wildean swells, and a brass band that looks (and sounds) like it’s been dragged up from the underworld. The most impressive costumes are reserved for the so-called ‘pioneers’ of different bonfire societies: they’re the advance guard of each new troop of firebugs. As well as torches, they wield the banners of the group they represent. Some of these are blazoned with human skulls or bucrania while one, in keeping with how this procession repeatedly alludes to other types of march, hails the glorious arrival of William of Orange on English soil. This motley fancy dress is interspersed with mischief. The majority of the ‘bonfire boys’ (who include girls) are decked out like gangs of smugglers. Their baggy, hooped woollen jumpers make me think of Dennis the Menace. The look is topped off with a dockers’ cap and a leather or cloth pouch strapped about the waist. 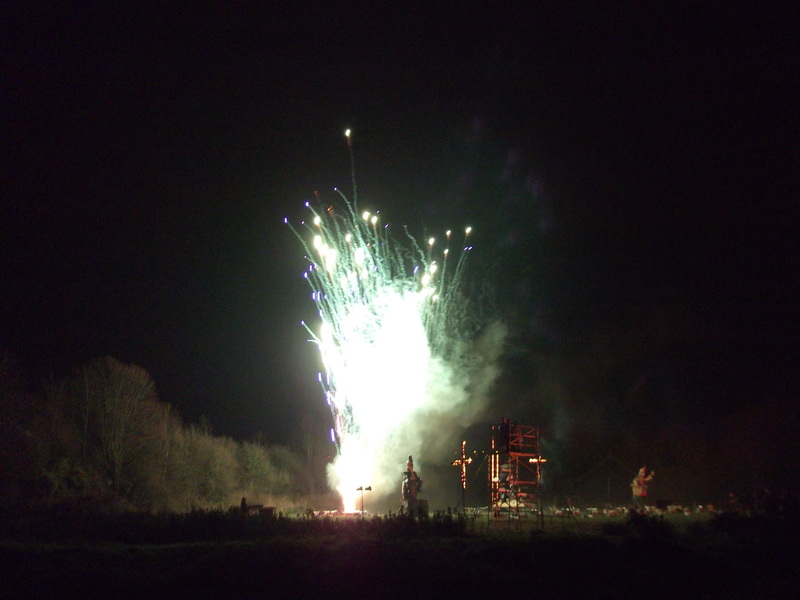 And those pouches are crammed with throw-down fireworks: bangers, squibs, home-wrapped ‘Lewes rousers’ and the stubby rook scarers or ‘rookies’, whose very name seems an excuse to fledge first-time visitors with a heart-nipping, close-range bombardment. Tonight these gunpowder marsupials have it in for us. As soon as they catch us bobbing from a flailing torch, as soon as they notice how tightly we’re pressed back against the yew hedge, ankle-deep in damp leaves, as soon as they realize our index fingers are clamped desperately in our lugholes, then a dozen hands dip into their ammo sacks. Whenever I manage to pick out one of the green fuses fizzing on the asphalt, I get a couple of seconds to anticipate the shock. But most of the bangs are very sudden. The rookies detonate close by and seem to come from all sides. Through the fabric of my jeans, the explosions sting my legs briskly like a slap. It makes for a strange meeting of care and disorder. Children as young as four or five grasp a torch in one palm and a parent’s hand in the other, as if being tutored in the mystery and mastery of fire. When the procession starts to bunch and stretch, the participants wait patiently until it flickers onwards. As soon as one branch files out of Albion Street, another is routed towards us from the opposite direction. But, as a naked flame retains an unpredictable quality even as it takes familiar shapes, so the Lewes Bonfire Night celebrations incorporate misrule into their meticulous planning. It’s noticeable when the younger marchers yell sharply at us to keep on the pavement (when there isn’t one). The licensed aggression of the procession also seems to legitimize little flash-points in the crowd, fire tempers. There’s a faint haze of menace here tonight that won’t lift, I suspect, until dawn. 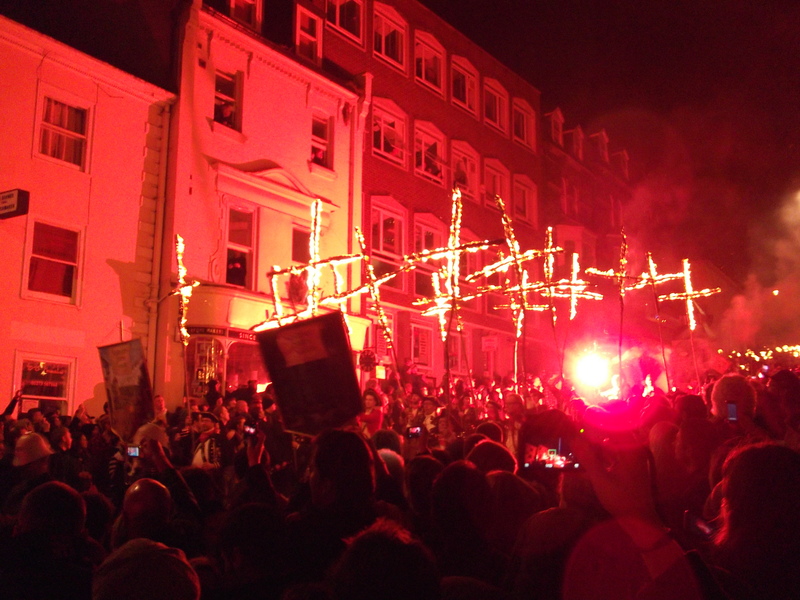 Throngs of teenagers chant and jostle in the side-streets (‘We are the Lewes boys! / We drink some beer and make some noise!’). A man shoves through drinkers outside a pub with a cry of ‘fire in the hole’ – giving minimal notice of the terrifying explosion to follow. A girl lobs a c-word at a police officer who, to his credit, lets her off with a barked warning about inflammatory language. At around 8pm, I see three policemen pinning a small, wriggling man to a brick wall. ‘Talk to me first, you idiots,’ he screams at them repeatedly as they fumble to snap on the bracelets. After the procession, we head in search of the Cliffe Bonfire site. At 10pm, the town’s six bonfire societies branch off and make for playing fields and farmland on the outskirts of town, where they ignite huge pyres, launch the big whizz-bangs, and blow up enormous effigies of popes, traitors, and topical bogeymen like Gadaffi and Murdoch. Lewes is a compact town, so we think to rely on directions. But, what with our temporary tinnitus and the increasingly conspiratorial attitude of the locals, reaching the Cliffe becomes a tall order. The first man I consult is convinced I’ve asked a rhetorical question. Hang a right at Waitrose, he finally tells us, past a pub called the Volunteer, then on a hundred metres from the hump-backed bridge. Over the bridge, a man propped against a burger van bunts us back ‘to the end of the precinct’, where we’ll be sure to see the signs. Back on the bridge, an official steward tells us to head past the burger van and follow the crowds… which empties us out of the town into a business estate on the ring-road, where an ambulance is parked up on a roundabout next to Tesco. If we keep to the road as it curves left, the driver says, and follow the crowds past Boots, then we’ll see the signs. We cross a modern bridge and, rather than trudge along the road as it curves right uphill, take a sharp left. Past Waitrose. We’re about to engage with an official steward on the hump-backed bridge when I notice the Boots logo, half-smothered by the plywood that’s been used to board up the shop-front. We see the signs. And follow the crowds. As we arrive at the bonfire site, the enormous pyre is rapidly consuming a Viking longboat. Earlier, the capricious array of historical costumes had me wondering what private local or traditional meanings were passing me by. Similarly, I feel this boat ought to have an undisclosed significance beyond what I see: which is a sagging pagan silhouette. We’re pegged behind an orange mesh fence and the effigies and explosives are set back at staggered distances like targets at an incendiary driving range. The smugglers, fifty metres in front of us, have turned their flash-bangs on three men in ecclesiastical garb, perched on a metal gantry. It’s an extraordinary spectacle but also, strangely, a welcome anti-climax: I feel like I’m safely in the audience for the first time tonight. There’s a yelp from a little boy on his father’s shoulders: ‘hurry up and burn the bloody Pope. I want to go to bed’. There are grand fireworks, then an inexplicable delay before they finish off Gadaffi.